How to Play Google Guitar and Songs You Can Play on Google Guitar? Now and then, Google surprises us with a fun and entertaining Doodle that you can’t get enough of. They have impressed us with Doodle such as a navigable submarine, or a Pac-Man arcade game that made us waste hours and hours of our time (not like we care anyway). The Google team hit it big with the creation of the Google Guitar Doodle, that to this day is one of the most visited Doodles despite that it was created more than a few years ago. It’s fun, and it’s addictive, but it’s worth every minute. Just as a heads up, when you go to the Google Guitar Doodle, on the bottom row, you are also going to be able to check out other fun doodles such as the Pac-Man game I mentioned, Terminal doodle, Snake Game, Google Mirror and you’ll also be able to do some underwater searching. You’ll know what I mean when you check it out. How to Use Google Guitar? You may have come across a Doodle of a Guitar, but what’s the story behind the Google Guitar doodle? 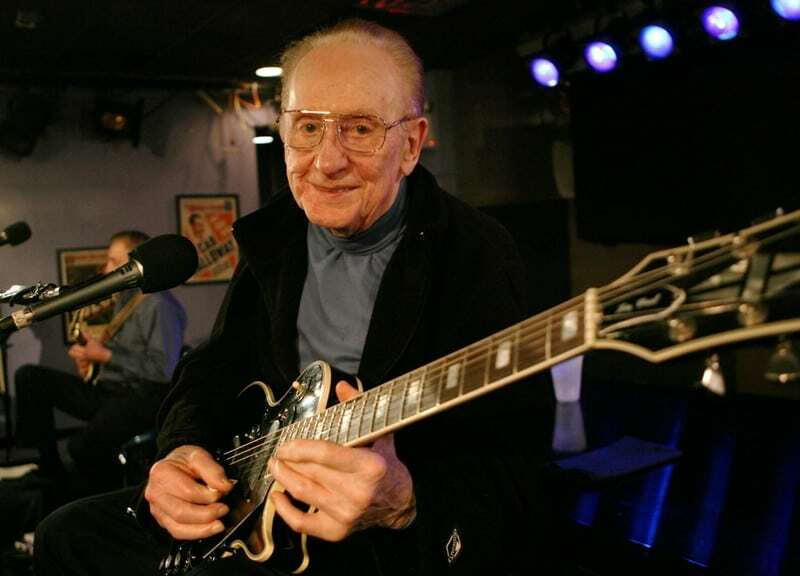 Google created that special Doodle to celebrate the 96th birthday of guitar legend Les Paul who passed away in 2009. Why was this person so special? He was special because he was the person who created the solid body electric guitar, a crucial piece that helped launch the era that we all know as rock and roll. He also helped develop many current recording techniques that include multi-track recording that allows today’s musicians to layer record sounds over one another in the recording studio. Now that you know why Google created this Doodle, now it’s time to figure out how you can use Google Guitar and have some fun with it. Just be careful that your boss isn’t anywhere near your desk since you can easily get carried away. When the Google Guitar doodle was first released, it was so addictive that users spent a whopping 5.3 million hours playing their favorite songs or creating their own. Don’t worry, learning to use the Google Guitar is easy since you will only need to use your keyboard or your mouse. The tough part comes when you have to memorize the number and letter combinations to play your favorite melody. If you are going to use numbers to play your songs on Google Guitar, don’t use the keypad since those numbers are not going to work. You need to use the number row right above the letter keys. If you have created your very own song and wanted to share it with family and friends, you’ll need to record it first. Before you start playing, make sure to click on the record button, and when it lights up, you are ready to rock and roll. Hopefully, your creation won’t be longer than 30 seconds since that is the time limit for this Google Doodle. Unfortunately, there is no timer to indicate when you are running low on time, so it looks like you will need to set a timer apart to keep track of time. Once you are done recording your masterpiece, click on the same record button and this time, it’s going to give you a link. You can share it with friends and family and show them the musician you have turned out to be. If you want to listen to the song you have created, hit the play icon that is going to appear on the left side of the link. If you don’t like what you hear, you can always re-record your musical creation. The Google Guitar has ten notes that go from a low G, and that goes as high as a high B. If you are familiar with the musical notes, keep in mind that each number has its note. The strings on the left side of the doodle are the C, E, and G notes. The strings in the middle are the B, G, B notes and the strings on the right side are the A, D, F# and A notes. Don’t forget that if you want to use your keyboard to play, each key will play a different note. For example, Q, 1, A, Z will play the same string that is the G note in the center of the Google Guitar Doodle. If you hit various keys at the same time to play some basic chords. For example, G major would be 1, 3 and 5. C Major would be 4, 6, and 8. Finally, D7 Major would be 4, 5, 7, 9. The Google Guitar Doodle wouldn’t be complete without Google official colors. And when you play the notes, you’ll see that each cord has its own official color to give it the finishing touch that only Google can give it. The previous information was for those to understand about music, but if you couldn’t care less about what notes are where and all you want is to hear some familiar sounds, here it is. Welcome To The Jungle by Guns and Roses – Just Kidding, if you can play that then you are my hero. As you can see, there are quite a few songs that you can play with Google Guitar Doodle honoring the American, country and blues guitarist. The Google Guitar Doodle is definitely worth a try. Even though most of us don’t understand a thing about musical notes, it is still fun to try. You can try and play out the songs to our favorite movies or TV shows. There is no doubt that this doodle was a great hit since when it first came out. The internet users were able to create five years worth of music in only two days. I have to admit that I had a lot of fun trying out the songs that I have recommended on my list of songs you can play on Google Guitar. However, I also confess that I need a lot of practice to be able to play decently. I was only able to play simple songs such as Twinkle Twinkle Little Star and the Star Wars theme, I know, pretty pathetic. Other users mastered songs such as Ode To Joy from Ludwig van Beethoven’s Symphony No. 9, Billy Jean by Micheal Jackson, Iron Man by Black Sabbath, One by Micheal Jackson and Here Comes The Sun by The Beatles, wow!. I don’t think I’ll ever get to that level, but I know that I will continue to play the Guitar Doodle for quite some time. Have you been able to give it a try? If so, what songs you have mastered so far? Also, if I missed any of your favorites, don’t forget to let me know what they are in the comments.